As an accredited institutional member of the National Association of Schools of Music, the UNA Department of Music and Theatre has much to offer--outstanding faculty, exceptional performing ensembles and quality degree programs, including professional degree programs in music education, general music, and music performance, as well as a liberal arts degree program in Music Business. Opportunities for performance in music include both large and small ensembles in the University's band, choral, and orchestral ensembles. 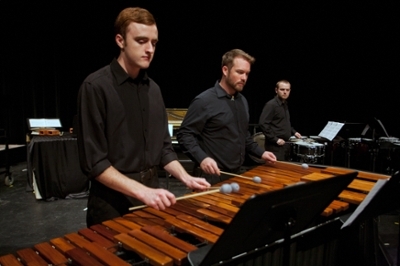 UNA percussionists study a range of styles including classical percussion, drumset, world percussion and marching percussion. The UNA Drumline were the winners of the 2013 PASIC Drumline Battle in Indianapolis. 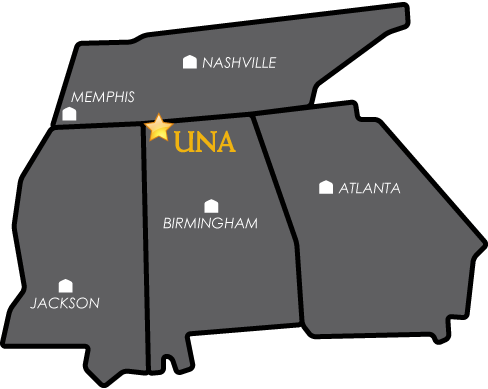 Location: UNA is located in Florence, Alabama. Our location puts us within easy access of Nashville, Memphis, Chattanooga and Birmingham. In addition there is a rich history with the recording industry right here in The Shoals area! The community is a great college town that helps to foster the camaraderie valued in the percussion program. Our location has also allowed students from UNA to take additional lessons with percussionists from many different areas near campus. Degrees and Tracks: UNA offers a Bachelor of Music in Music Education, a Bachelor of Arts in Music in Performance and Commercial Music degrees. Lessons: All UNA percussionists take lessons ranging from half an hour to one and a half hours a week. These lessons focus on all aspects of performance, from orchestral, chamber and solo literature to drumset. A student graduating with a percussion degree from UNA will be comfortable performing a wide range of styles in any given setting. The size of the program is limited to assure that any student studying percussion at UNA will study with Dr. Wiggins or Ms. Quinn. Students will commonly take lessons with both teachers to become more complete percussionists. Studio Class: In addition to the above, we hold a weekly studio class during which students perform for critique from their peers. The studio class also discusses topics ranging from the history of percussion to important new works in the percussion literature. Guest Artists: Guest artists in various specialties, ranging from orchestral percussion to drumset artists, visit the percussion department at UNA during the year. The guest artists typically perform a solo recital and teach lessons in addition to presenting a masterclass for the percussion studio. Equipment: The UNA Percussion Studio is housed in the Music Building. This building contains our extensive collection of instruments as well as lots of practice space for percussion majors!